Last week, Bleacher Report’s Tyler Dunne published a fairly scathing report about the demise of the Aaron Rodgers-Mike McCarthy relationship that ended with McCarthy’s firing this past NFL season. The article, which included interviews with various former Green Bay Packers players, some of whom went on the record and some who did not, lays bare a relationship fraught with tensions, blame, big egos, and problems that kept mounting with every loss. Not to mention details like McCarthy’s alleged penchant for getting massages in his office instead of joining his players for game prep. The piece was equal parts damaging to both the quarterback and the coach, whose problems with one another have been an open secret for some time. Whatever you think of the claims in the article, it reads like something that’s been buttoned up pretty well. There are lots of sources and plenty of evidence to back up many of the claims, or at least strongly imply their accuracy. As for Rodgers, he remains relatively quiet over the weekend. Turns out, he was waiting until his appearance Monday with Jason Wilde and Mark Tauscher of ESPN Milwaukee to unload. “This was a smear attack by a writer looking to advanced his career talking with mostly irrelevant, bitter players who all have an agenda whether they’re advancing their own careers or just trying to stir old stuff up,” said Rodgers. To be fair, there was a time when anything that was written by Bleacher Report likely would have been dismissed on principle. The site’s origins as a sports content farm were legendary. But the site has since grown up and worked to shed their reputation for hot takes, hiring talented reporters and expanding their reach. And for his part, Dunne has a significant background in NFL beat reporting; he previously worked the Packers beat for the Milwaukee Journal-Sentinel for four years and spent a year as the Buffalo Bills beat reporter for The Buffalo News. All I'm going to say is that I've known @TyDunne a long time. This is not someone who writes hit pieces to advance his career. Which is why his career has advanced. The Green Bay quarterback also went on to try to dispel two key excerpts from the article (transcript by Pro Football Talk). 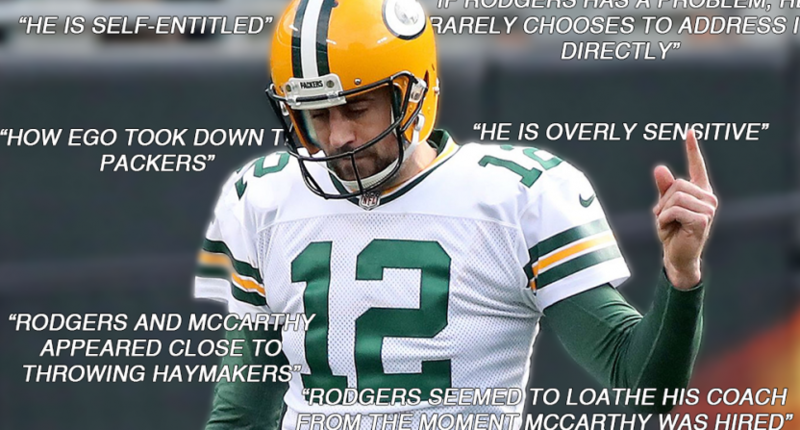 While he denied the depth of the claims made in the article, Rodgers did admit that his relationship with McCarthy was strained. Rodgers now talking about his former coach: "I love Mike McCarthy. Mike has been a huge part of my success in my career." Acknowledges they have had issues, as any long issue does, but always dealt face to face. Asked if he has any regrets about his relationship with McCarthy, Rodgers says: "I wish I hadn’t said anything after the Bills game last year." Said he wasn't trying to be disrespectful, but knows how it came across. "The beauty in our relationship is it grew year after year." There are two ways to look at Rodgers’ reaction to the article, of course. The article gives you the notion that Rodgers is a thin-skinned and sensitive superstar who seems entitled at the expense of others. And his reaction, to smear the writer as a liar and call his former teammates “irrelevant” certainly feeds into that. Or, you can come away from it thinking that Rodgers sees the situation as more nuanced than those on the outside and felt compelled to defend his honor and let people know he respects McCarthy even if they didn’t always agree. Both could be true. One could be truer than the other. Or only one of them could be true. It’s certainly possibly reality exists somewhere in the middle, or maybe we all just like to see ourselves as being a bit more altruistic as others do. It just seems far-fetched that Dunne would go out of his way to purposefully write a “smear campaign” for a major outlet knowing the blowback that would come his way.